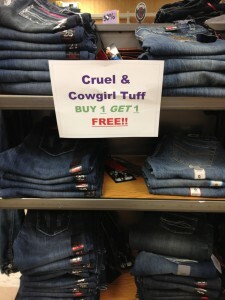 Hurry into Bar None Country Store for a great offer on Cruel & Cowgirl Tuff Jeans. Buy one pair of Cruel or Cowgirl Tuff Jeans and receive one pair FREE! We have a large selection of styles and sizes. Don’t miss out on this great opportunity to have a new pair of Cruel & Cowgirl Tuff Jeans for the fall. This entry was posted on Friday, September 27th, 2013 at 1:57 am	and is filed under News & Updates, Specials. You can follow any responses to this entry through the RSS 2.0 feed. Both comments and pings are currently closed.